Background: Though after a start of genome sequencing most of the protein sequences are deposited in databases, some proteins remain to be unannotated and functionally uncharacterized. Chlamydia trachomatis L2C is a gram-negative pathogen bacterium involved in causing severe disorders like lymphogranuloma venereum, nongonococcal urethritis, and cervicitis. Objectives: Analyzing and annotating the hypothetical proteins can help to understand its pathogenicity and therapeutic hotspots. 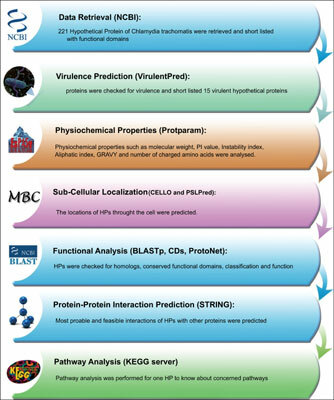 Its genome encodes a total of 221 hypothetical proteins and out of these, 14 hypothetical proteins are declared as virulent by virulence prediction server (VirulentPred). Methods: In this study, the functional and structural analysis was carried out by conserve domain finding servers, protein function annotators and physiochemical properties predictors. Proteinprotein interactions studies revealed the involvement of these virulent HPs in a number of pathways, which would be of interest for drug designers. Results: Classifier tool was used to classify the virulent hypothetical proteins into enzymes, membrane protein, transporter and regulatory protein groups. Conclusion: Our study would help to understand the mechanisms of pathogenesis and new potential therapeutic targets for a couple of diseases caused by C. trachomatis. Nongonococcal urethritis, virulent hypothetical proteins, elementary bodies, chlamydia trachomatis, pathogenicity, enzymes.